One of the new jack football axioms is that you run when you win, not win when you run. It's insulation against the backwards idea that successful offenses are built around a dominant running game, and more of a guideline than a hard truth. 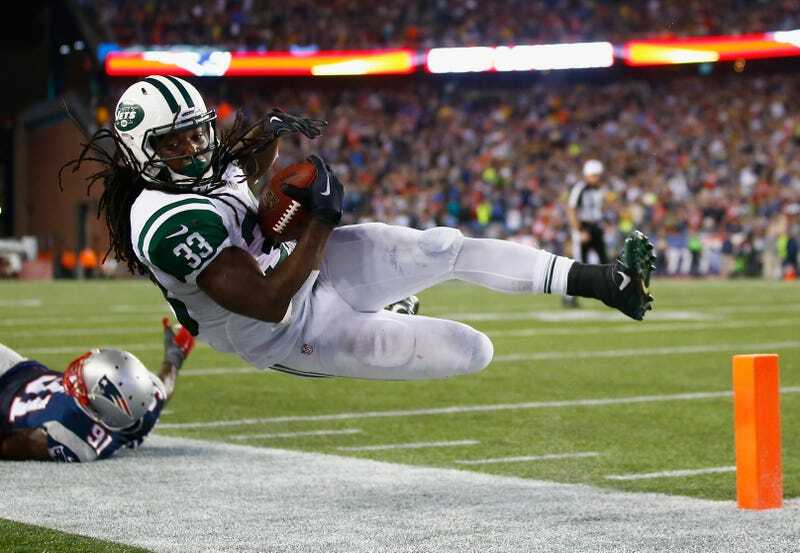 Leave it to the Jets to stretch even benign football wisdom to its breaking point. To answer a question posed on NFL Reddit last night, no, no team has ever run for 200 yards, held the ball for 40 or more minutes, and committed zero turnovers and lost a game. The Jets are the first. Last night against New England, the Jets ran for 218 yards, didn't have a single turnover, and had possession for 40:54. They lost, 27-25. Since 1940, only two teams have managed to pull this off at 35 minutes of possession (San Diego at Denver in 2011 and St. Louis at Atlanta in 2008) and seven teams in 30 minutes of possession. The loss is even more baffling because the Patriots didn't have any turnovers to account for the possession discrepancy, like some similar games where the both teams ran wild and one happened to cough the ball up. But the Nick Folk showcase in the first half—along with the controversial but probably fine block at the end—was enough to pin the Jets right there at the top of the board for innovation in ineptitude.